Participating restaurants include two in Black Mountain — The Madison and Morning Glory Cafe — both of which are a very short distance from our Bed & Breakfast. 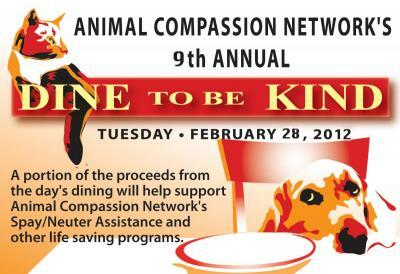 At least 50 Asheville area restaurants are part of Dine to be Kind, so if you’re in our neck of the woods on Tuesday, February 28, you’ll have the opportunity to help out with a great cause and get a great meal! See more details at http://www.animalcompassionnetwork.org/. This entry was posted in Uncategorized by Inn on Mill Creek. Bookmark the permalink.